LightMAC owns experienced medical teams, ensuring that all medical treatments are scientifically and clinically proved. LightMAC prides its sophisticated equipment which acknowledged by the CE marking, the Food and Drugs Administration (FDA) and Korea Food and Drug Administration (KFDA). In short, LightMAC provides professional and caring medical beauty services for clients. Q-Switch Nd: YAG 532 Laser Treatment with a shorter wavelength can destroy melanin instantly. The melanin will then be removed through metabolism. This treatment targets melanin or spots in epidermis like freckles, sun spots, café au lait spots, etc. Superficial pigments such as freckles, sun spots, café au lait spots, etc. can be alleviated by Q-Switch Nd:YAG 532 Laser. Q-Switch Nd:YAG 532 Laser Treatment can remove purple, red and orange tattoos significantly. The fractional 1565nm laser is a non-ablative skin resurfacing treatment with no removal of skin layers. The primary chromophore is water, while the absorption by the main competing chromophores is low. Deep dermal penetration of light energy is permitted. The high precision homogenous micro-beams create narrow, deep columns of tissue coagulation in the epidermis and dermis. Outstanding scanning capabilities enable controlling energy, density, size and shape of each scan. As such, the skin is rejuvenated and scars are smoothened. The high precision homogenous micro-beams create narrow, deep columns of tissue coagulation in the epidermis and dermis. Outstanding scanning capabilities enable controlling energy, density, size and shape of each scan. The stratum corneum and the surrounding tissue are left unaffected. It stimulates natural healing response and new, healthy tissues are formed. The skin is rejuvenated; stretch marks and scars are smoothened. The Picosecond Laser is the latest laser technology to achieve faster and better results, therefore reducing the number of treatment sessions and making the effects more apparent. The treatment uses laser in different wavelengths, along with different lenses and focusing technologies, in order to meet the different needs of the skin, such as targeting melanin in the different layers. It can effectively improve the skin texture and quality to achieve the best treatment effect. Removes dermal and epidermal pigmented lesions Lasers in different wavelengths can be used to reduce the accumulation of pigments in the dermis and epidermis, such as melasma and post-inflammatory hyperpigmentation. They can also enhance the microvascular system and cytokine secretion, which inhibit the formation of melanin, and thus effectively improve the pigmentation problem, making the overall skin tone brighter. The dual focus technology can stimulate the skin to restart its repair mechanism, induce collagen regeneration, enhance metabolism, accelerate the elimination of pigmentation, improve the depressed scars due to improper treatment of acne, enhance skin elasticity and achieve skin rejuvenation effect. When there is inflammatory acne, vasodilation causes the affected area to become red and swollen, and the body also produces vascular endothelial growth factor (VEGF) to stimulate blood vessel regeneration, forming a red mark after acne. The picosecond laser can enhance the microvascular situation and remove red marks after acne. Different wavelengths of picosecond laser treatment can effectively target and remove tattoos of different colors, and dermal pigments such as birthmarks. The ultrasound radio frequency, approved by FDA and CE, is a non-surgery treatment. By combining the power of monopolar RF, ultrasound and active shielding technology, the treatment can effectively target and heat up subcutaneous fat layer at 46°C,aAt the same time, the skin surface cools down to lowest 10°C to protect the skin from burns, and prevent blisters and other complications simultaneously. It target fat cells naturally die through apoptosis and removed from body by circulation system. Real time temperature monitoring system can monitor the skin surface temperature, to ensure safety and prevent skin burn, achieving the best and reproducible clinical results. The treatment safely and effectively treats stubborn subcutaneous fat tissue in various body parts, with no downtime and anesthesia is required. The treatment is safe, comfort and reliable to reduce fat, increase skin elasticity, tighten the skin effectively. Thermage works in just one treatment to improve the appearance of sagging or loose skin, giving a smoother, sleeker and younger look and feel. It is non-invasive radiofrequency energy to kick start the body’s own natural renewal process. Radiofrequency energy penetrates deep into the skin’s tissue, heating the treatment areas and remodeling the collagen. With the latest patented Comfort Pulse Technology (CPT®) – gentle vibrations and interspersed cooling, Thermage Total Tip 3.0 transmits the heat energy to skin layer in 2.5mm depth, to deliver better patient comfort. The newly introduced Thermage FLX™, uses the unique 4.0 cm² Total Tip with new AccuREP™ Technology which enhances treatment comfort and efficacies. High-Intensity Focus Ultrasound (HIFU) Tightening Treatment is a non-invasive medical treatment. Medical ultrasonic technology adopted in the treatment was used in burning tumour to cure diseased tissue in 1940. The principle of HIFU is similar to use a magnifier to focus sunlight, targeting on the superficial muscular aponeurotic system (SMAS) of specific areas. SMAS is a fascia which is located right above the muscle connecting the subcutaneous fat and shallow face muscles. It covered between the cheeks to court neck muscle. SMAS will be heated up and underlying load bearing capacity will be improved. The effect on skin tightening would be more significant. 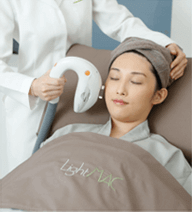 Ultrasound waves concentrate and generate heat to certain target areas at SMAS layer (4.5mm) and deep dermis with collagen (3.0mm) up to 60-70°C immediately, resulting in protein denaturation. SMAS will be tightened and collagen will reform, resulting in contour lifting. HIFU High-Intensity Focus Ultrasound Tightening Treatment enhances collagen rejuvenation in the dermis. The collagen and elastin in skin will be increased leading to skin firming, pores refinement, skin tone brightening and dehydration. As the Superficial Musculo-Aponeurotic System (SMAS) is the fascia connecting the subcutaneous fat and shallow face muscles, when SMAS is heated and contracts, muscle and skin will contract simultaneously. Thus skin will be lifted, double chin and neck will be tightened. V Lift Treatment uses the original theory of Thermal Diﬀusion Treatment (TDT™) Technology. It accelerates the remodeling of collagen by giving a strong heating to the collagen fibers in dermal layer by rapid irradiation of the focused ultrasound at the superficial muscular aponeurotic system (SMAS) at high speed without damaging the skin surface layer. Strong thermal energy causes contraction and neo-collagenesis in the skin. The pen applicator provides minimal contact surface can be brought into close contact with the curved area of the face to deliver proper energy closely to the skin. It is able to get various types of heat energy into the skin more eﬀectively, and it is eﬀective in face lifting and skin tightening. The non-surgical and non-invasive treatment is less painful for patients, and requires no downtime, with immediate results. V Lift Treatment can achieve wrinkle removal, skin tissue lifting and tightening effect, stimulate collagen remodeling and SMAS contraction to enhance the face contour. The treatment is safe and reliable to increase elasticity, improve wrinkles, tighten sagging skin, so as to give a refined, youthful appearance. PDO, Polydioxanone, is a material that is acknowledged by the highest safety level by the Food and Drug Administration (FDA). It has been used for more than 30 years in surgeries, especial plastic surgery and cardiac surgery, as subcutaneous sutures. The threads dissolve and are metabolized to carbon dioxide and water and ultimately eliminated from the body in 6-8 months. During the PDO Thread Lift treatment the threads are implanted into the sub-dermal skin to boost the production of collagen by stimulating fibroblast. The skin becomes firmer, helping overall face contouring and skin elasticity. During the PDO Thread Lift treatment the threads are implanted into the sub-dermal skin to boost the production of collagen by stimulating fibroblast. The thread dissolves itself and is metabolized, ultimately eliminated from the body in 6-8 months. It helps seamless lifting, collagen rebuilding and skin tightening. The skin becomes firmer, helping overall face contouring and skin elasticity. Rejuvenation Brightening Intradermal Injection Treatment is a precise injection of concentrated revitalizing whitening solution into the dermis. The treatment suits all skin problems. With the CE marking, the revitalizing whitening solution guarantees a comprehensive quality, safety and efficacy. The solution contains the hyaluronic acid, one of the fundamental components of the skin. Its large variety of essential micronutrients provides relief for skin tissue deficiencies and enhances cell repair. It also protects the cell lipid membrane, prevents from oxidizing damage, and lightens the skin. The revitalizing solution being used in the treatment combines vitamins, amino acids, mineral salts and co-enzymes. The balanced formula stimulates cell biochemical processes and increases cell trophism of the connective tissue. The revitalizing solution contains high vitamin C which is able to neutralize free radicals of cell, fulfilling both a preventive and palliative action of oxidizing damage of ultraviolet radiation in epidermal cells. It also lightens the skin, inactivates tyrosinase, preventing the formation of hyperpigmentation. Rejuvenation and Lifting Intradermal Injection Treatment is a precise injection of concentrated revitalizing lifting solution into the dermis. With the CE marking, the concentrated solution guarantees a comprehensive quality, safety and efficacy. The solution contains the hyaluronic acid, one of the fundamental components of the skin. It is capable of retaining hundreds of times its weight in water. The solution has cell repairing and restructuring properties. It also promotes collagen and protein synthesis to prevent aging, at the same time provides intensive moisturizing. The solution being used in the treatment stimulates skin tissue repair. It has moisturizing and antioxidant properties and also restores cell proteins and the dermal connective tissue by activating cell metabolism. It protects the cell membrane from the effects of free radicals and encourages skin repair by promoting collagen synthesis. Contour Lifting Intradermal Injection Treatment is a precise injection of concentrated solution into the dermis. With the CE marking, the contour lifting solution guarantees a comprehensive quality, safety and efficacy. The solution contains the hyaluronic acid, one of the fundamental components of the skin. It is capable of retaining hundreds of times its weight in water. The solution has moisturizing and anti-oxidizing properties. It also restores cell proteins and the dermal connective tissue by activating cell metabolism. It creates immediate lifting and firming effect. The reaffirming solution returns firmness to the tissues undergoing the aging process, effectively counteracting flaccidity. Tricology Hair Rejuvenation Treatment is a leading edge hair growth technology by injecting active ingredients into the dermis to effectively stimulate and treat the fragility, weakness and general alopecia. The solution plays a major role in the metabolism of carbohydrates, proteins and fats to strengthen and restructure hair fiber from the root. It stimulates cell restoration and accelerates hair regeneration to prevent hair loss and improve diffuse alopecia. The cocktail formula of different nutrients acts to activate skin microcirculation to stimulate healthy hair follicles and reactivates the hair formation process. It revitalizes fading cells and extends the hair follicle growth cycle. The tricology hair growth intensive lotion stimulates the hair follicles and regenerates the scalp. It enhances blood flow to facilitate the delivery of nutrients to hair follicles, accelerating hair growth rate. Breakages and premature loss of hair will be reduced. Thermage works in just one treatment to improve the appearance of creepy, sagging skin and unwanted bulges and dimples. It is non-invasive radiofrequency energy to kick start the body’s own natural renewal process. Radiofrequency energy penetrates deep into the skin’s tissue, heating the treatment areas and remodeling the collagen. With the latest patented Comfort Pulse Technology (CPT®) – gentle vibrations and interspersed cooling, Thermage Total Tip 3.0 transmits the heat energy to skin layer in 2.5mm depth, to deliver better patient comfort. Collagen will contract instantly after the appropriate heating process, and will rejuvenate and re-grow at the same time. Benefits include smoothing of creepy skin, alleviating unwanted bulges and dimples, and improving the appearance of cellulite. Skin condition may affect one's personal image and impression. If unattended, skin problems can only worsen with age. 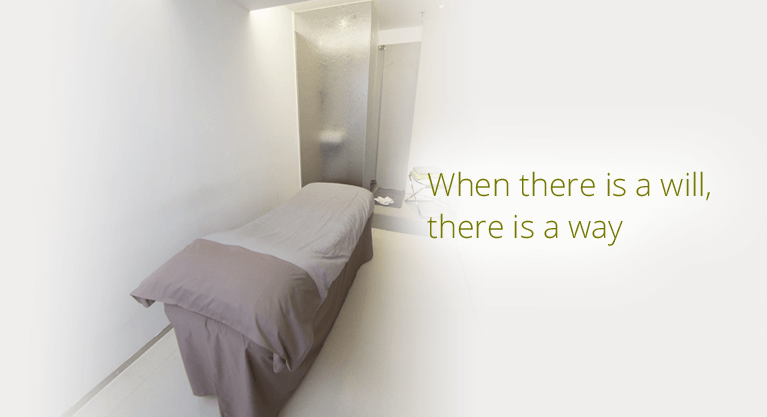 Therefore, LightMAC offers an array of facial treatments to pamper your skin. Exquisite as well as functional, our facial care services combine skincare therapies with quality skincare products to restore youthful beauty to your skin. All skincare products used in the facial treatments contain the epidermal growth factor (EGF), which stimulates cell growth and proliferation to replace the dead or damaged ones. Thus, it delays aging, inhibits wrinkles, whitens the skin, and restores youth. Ultrasonic beauty device generates sound waves with frequency over 20,000Hz. The ultrasonic vibration at the speed of 1,000,000 times per second can massage the dermis and subcutaneous tissues, to enlarge gaps between cells and increase the skin temperature by 0.5-1°C, which can facilitate microcirculation and enhance the absorption of nutrients of skin. Different beauty essences will be selected according to customers’ skin conditions, maximizing the treatment result. Ultrasonic treatment stimulates the growth of new collagen, repairs elastic fibres and dissolves excessive fat cells on face to smooth out eye wrinkles and lift face contour. With the advanced technology of the supreme medical oxygen infusion device from US, oxygen infusion can eject 6 litres of a concentration of 95% pure oxygen in one minute. Due to the high speed, the nutritional essence will be spurt in very tiny molecules mixed with oxygen molecule. Oxygen under pressure can be effectively penetrated into deep skin and enhances the skin absorption of the Infusions. This accelerates skin cells to reproduce and regenerate. Different beauty essences will be selected according to customers’ skin conditions, maximizing the treatment result. The oxygen Infusion is an anti-aging treatment that helps increase the skin’s moisture levels, tightens pores, and tone of skin. It accelerates skin cells to reproduce and regenerate to heal wounds, remove spider veins and improves sensitive skin. It also helps stimulate collagen synthesis to improve fine lines, wrinkles, and elasticity of skin. Skin absorption is enhanced and metabolism is facilitated to reveal healthy and vitalized skin. Microcurrent treatment is a low level of electricity that mirrors the body‘s own natural electrical currents, triggering chemical reactions at a cellular level to enhance the production of natural collagen and elastin. It encourages the skin cells to heal and repair themselves naturally. Skin will thus be tighter and firmer. The microcurrent also stimulates acupoints and meridians to help facial rejuvenation. Blood circulation and lymphatic flow are increased microcurrent technology to promote skin absorption, resulting in healthy and radiant skin. Microcurrent rehabilitates the underlying muscles and improves blood circulation to give better tone to the face. The muscles of the face are manipulated during the microcurrent treatment. The muscles are re-educated and re-trained to maintain a new contour. Microcurrent treatment allows the muscles the necessary energy to keep their tension in this new contour. The treatment targets skin problems including wrinkles, saggy facial skin, droopy and fat accumulation. It encourages eye muscle movements and improves the blood circulation in order to reduce wrinkles, dark circles, eye bags and crow’s feet. Electroporation is a physical transfection method that uses an electrical pulse to create temporary pores in cell membranes through which nutrients can pass into cells. An electrical pulse at an optimized voltage and only lasting a few microseconds to a millisecond is discharged through the cell suspension. This disturbs the phospholipid bilayer of the membrane and results in the formation of temporary pores. The electric potential across the cell membrane simultaneously rises to allow charged molecules to be driven across the membrane through the pores in a manner similar to electrophoresis. Electroporation is a comfortable, needle-free and non-invasive technology. The impulse can break the nutrients into small molecules for easy absorption, which is similar to the nanotechnology. The Electroporation current is steady, safe and painless. The patients can also appreciate visible results with the heat and cool therapies. Electroporation reduces the cell wall’s resistance to allow the transfer of nurturing solutions into the skin cells. It enhances the skin absorption, preventing oxidation and aging, improving tiredness, dullness, sagging, coarse pores and sensitive skin. The heat therapy enhances skin rejuvenation by facilitating the blood circulation and increasing collagen production to decrease wrinkles and tighten skin. Electroporation with cool therapy helps calming the skin, reducing pain and skin erythema. It strengthens fragile and weak skin, tightens pores, and reduces excessive sebum secretion and inflammation. It also helps to nourish the skin, and increase skin elasticity. Lymph and blood cells are distributed throughout the body. Lymphatic system is an important circulatory system and a vital part of the immune system of body that helps maintain fluid balance in the body by collecting excess fluid and particulate matter from tissues and depositing them in the bloodstream. It also helps defend the body against infection. Bacteria and other waste material are picked up in the lymphatic fluid and trapped inside lymph nodes, where they can be attacked and destroyed. There are more than 800 lymph nodes in the body and more than 200 of them are found in the throat. When the lymph system becomes congested and loses its ability to remove waste efficiently, different symptoms like bloating, dry skin, puffy eyes, breast swelling or soreness, obesity and cellulite are developed. Manual lymphatic massage, developed by Danish physiotherapist named Drs. Vodder, can facilitate the flow of lymph fluid to help the system works properly. Manual lymphatic massage is suitable for people who are tired, suffering from bloating and lymph swelling. It is able to ease symptoms like swelling due to sprains and bruises, edema due to irritation and dental treatments; and muscle cramps due to repetitive stress or strain. Lymphatic massage can serve as a preventive for swelling and stretch marks if it is begun before the fifth month of pregnancy. Hot stone massage is originated from Native Americans. Native Americans use stones as massage tools for health care purpose. Basalt stone, a type of ore, is commonly used in hot stone massage nowadays. The colours of stone have different results on the body. Purple stone has the best healing power, green stone inherits the strongest magnetic field, and black stone has the highest heat resistance. Essential oils are used in the massage. Therapists will move hot stones along the acupoints and meridians to enhance essential oil penetration, to achieve a therapeutic effect. Hot stones remove negative energy from body. The stones are heated up to a certain temperature and placed on the acupoints and meridians of the body, which in turn balances the energy flow and throughout the body, and encourages the blood to circulate more properly within the body. It gives a sense of calm and stimulates the lymphatic system. The nervous system is put into a calmer state and thus relieves the mind of anxiety. The heat loosens up muscles tightened and tensed by stress, thus taking away the pain and the cramping. It also helps to release toxins and to get rid of stress. Aromatherapy massage is massage therapy using highly concentrated plant oils, called essential oils. The use of essential oils for therapeutic purpose goes back to the ancient civilizations including the Egyptians and Romans. In 1928 a French chemist Rene Maurice Gattefosse discovered the healing properties of essential oil after a laboratory accident. He subsequently researched the properties of essential oils and was the first to pass his findings on to the medical profession. In 1964 a female biochemist Marguerite Maury first incorporated essential oils in aromatherapy massage. Nowadays, a comprehensive Holistic Therapeutics System has been developed. With professional analysis with patients, therapists can suggest the best combination of essential oils to improve both physical and emotional wellbeing. Essential oil will be absorbed by the skin effectively through aromatherapy massage. It is ideal for general physical and mental revitalization, stress and anxiety control, combating negative feelings, strengthening the nervous system, pain relief, relaxation of tired and stressed muscles, improvement of blood circulation, cellulite prevention, toxin removal, promotion of restful sleep, relief of painful menstruation, and reduction of dysmenorrhea and menopausal symptoms.